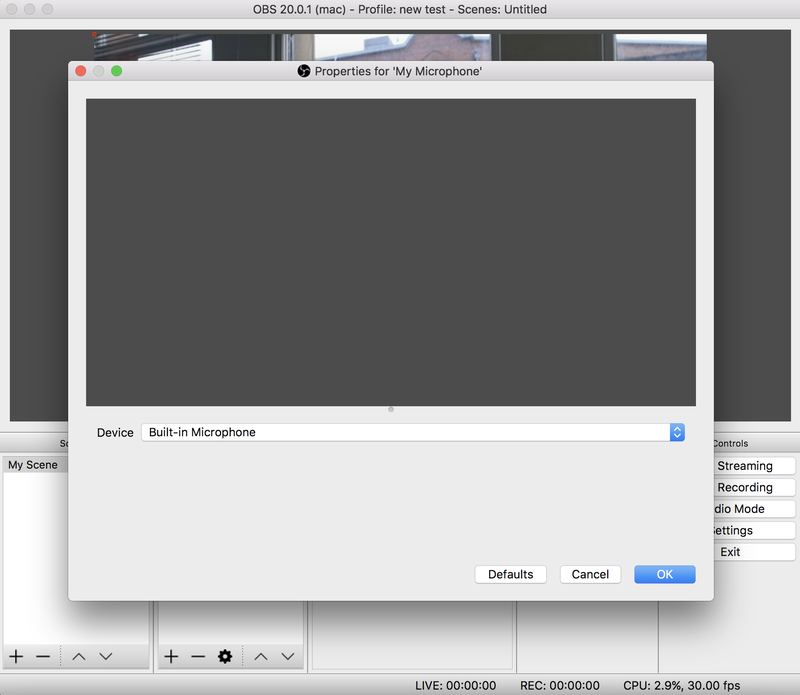 A computer (Mac or Windows) with Open Broadcaster Software (OBS) installed. Download and install OBS for your computer. A Facebook page for your radio station. Set one up by following this guide. A stable internet connection. Your connection will need to be able to upload at a constant speed of at least 5-10 Mbps. Check your internet connection speeds. 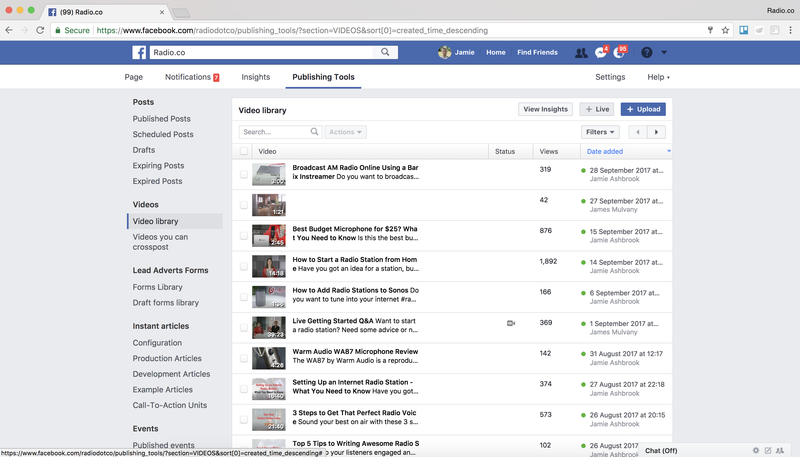 Once you have got these three requirements sorted, you are ready to start setting up your Facebook page and OBS. Once you have OBS up and running, you will need to create a Scene. A Scene is a combination of video and audio. For example, you could have your webcam for your video and microphone for your audio. Create your first scene by adding Sources. 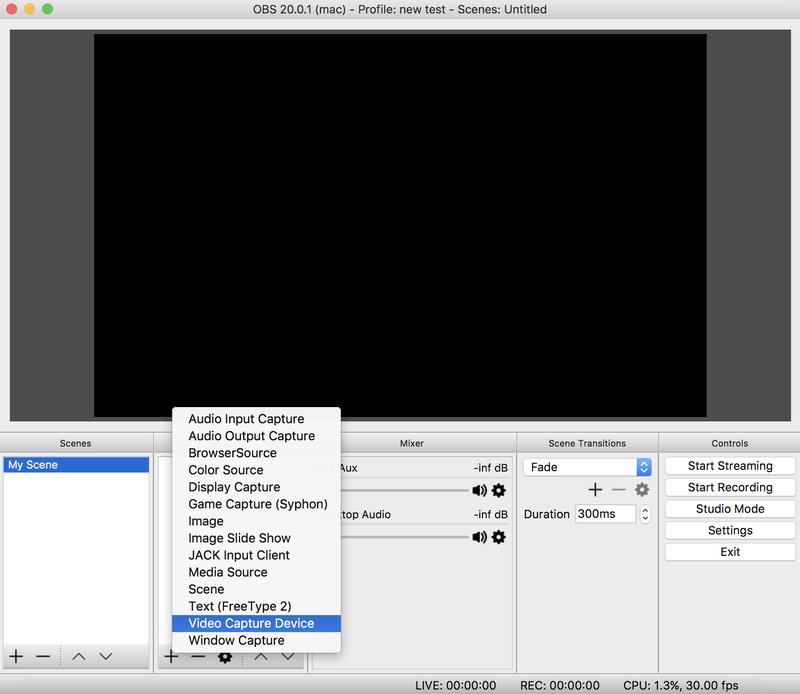 Click the + button in the Sources box, then select Video Capture Device. 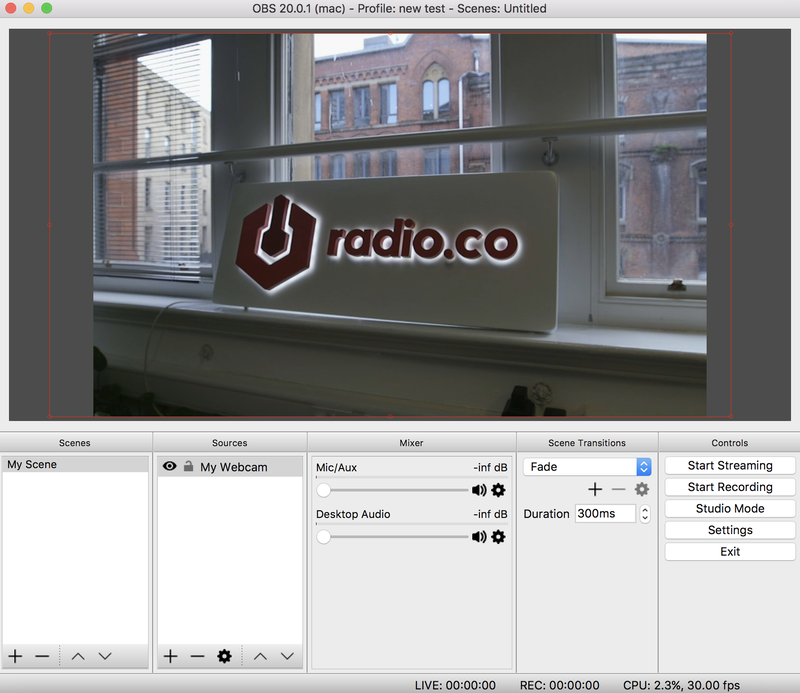 Name the device, like “Radio Studio Webcam”. Name the device whatever you like, for example, “Radio Studio Webcam”. 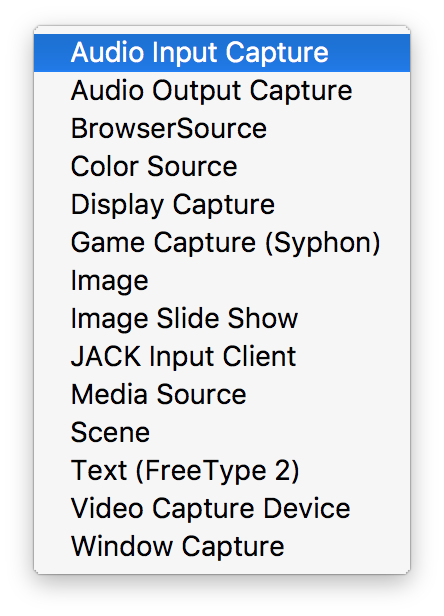 Choose your video device from the drop-down list. Change the preset to your preferred screen dimension, for example, 1080p is 1920x1080. The webcam has now been added to the video space. 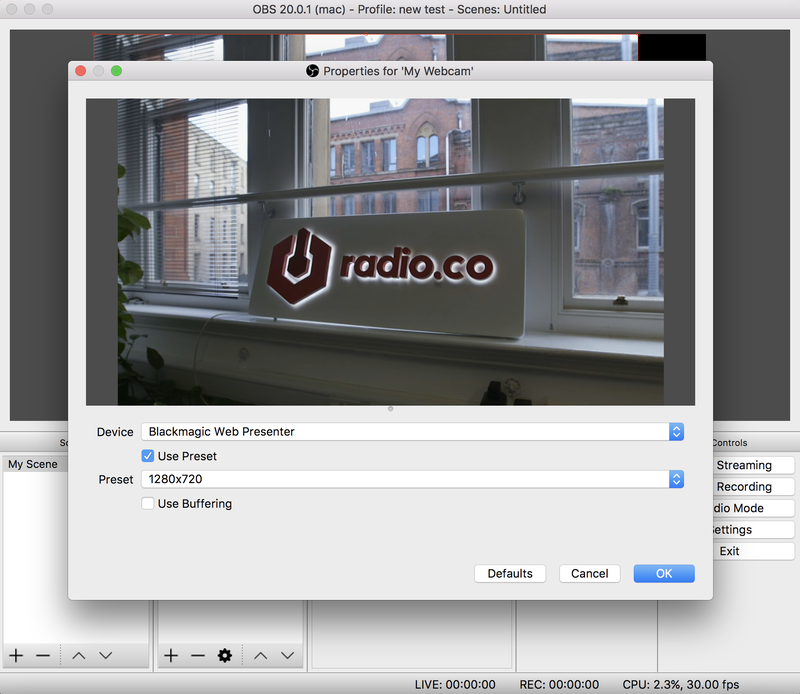 You can resize and reposition the newly added video source. Click and drag the video to adjust what your viewers will see. Now the video is sorted, add the audio to the Scene. Click the + button in Sources and select Audio Input Capture. On the next screen, select an audio device from the drop-down list, for example, this could be a built-in microphone or an external microphone from a mixer. Inject some personality into your video. Add your station’s logo by selecting Image from Sources. Now you’re all set up! Head over to Facebook to start setting up your live video. Log into your Facebook page. Select Publishing Tools in the top navigation bar. In the left menu, click on the Video Library option in the Videos Section. 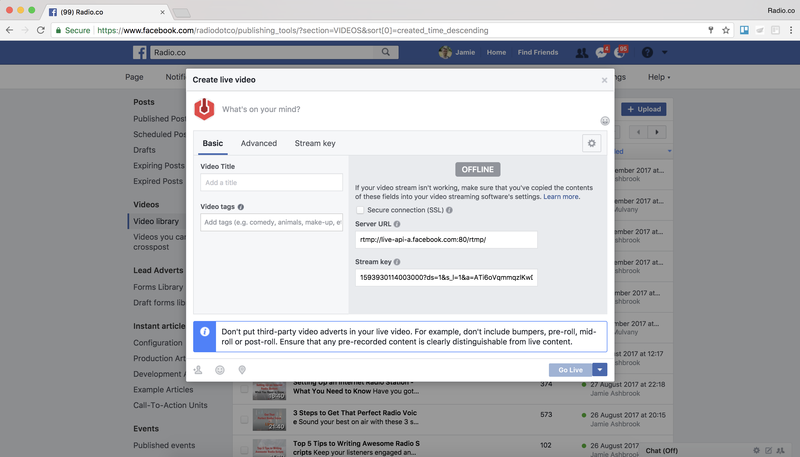 Click the + Live button in the top right corner to start setting up your video. Two options will appear as Single Field and Separate Field. As you are using OBS, copy the text inside the Stream Key box under Separate Fields. Important: The link you copy here can only be used for this live video. If you want to add another live stream, you will need to follow these steps again to get a new link to use in OBS. In OBS, go to Settings and select Stream. 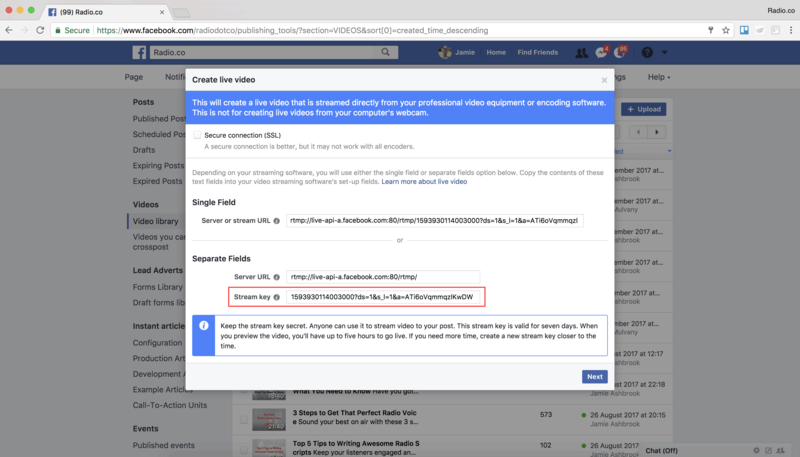 Change Service to Facebook Live and paste in the key you just copied into Stream Key. Click OK to save your changes. OBS is now set up and ready to go. 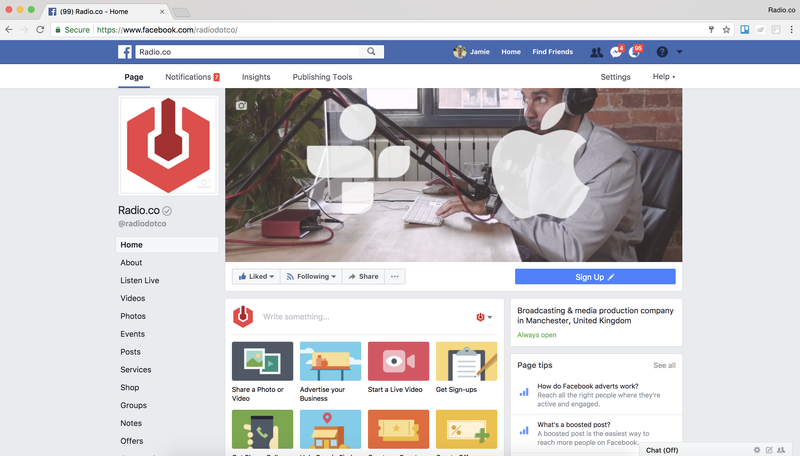 Finally, you need to go back to your Facebook video to finish setting up before going live. If you have still got the window open with the Single and Separate Fields, click Next. You will then be given the option to add a title and tags to your video. In here you can set up Audience Restrictions to specify age ranges, locations, and languages. 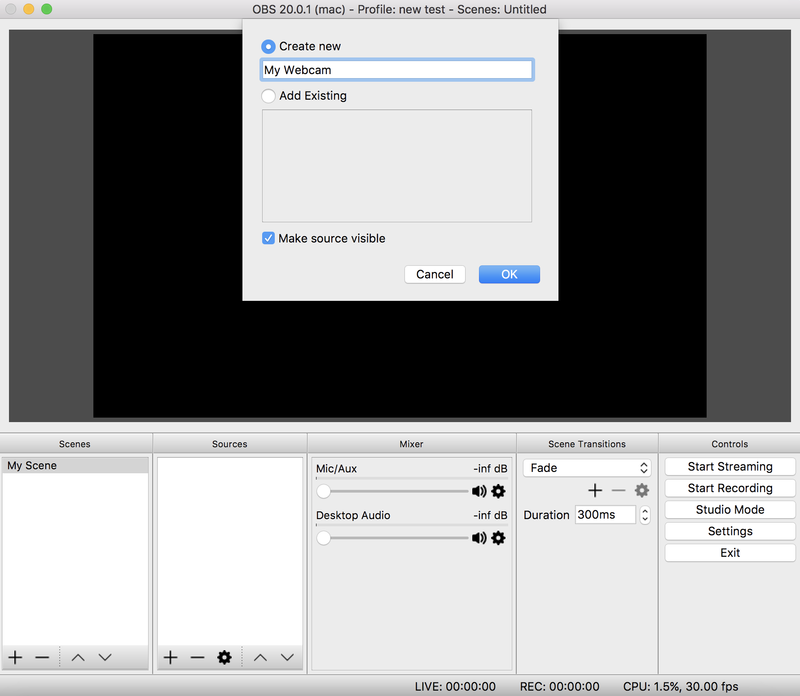 When you are ready to connect, select Start Streaming in OBS. It should connect to Facebook after about 30 seconds depending on your connection’s speed. You should see a preview once connected. Start broadcasting to your audience by selecting Go Live. Alternatively, schedule the live video for later so you can prepare beforehand. Your audience will be able to tune in and enjoy your broadcasts with you. 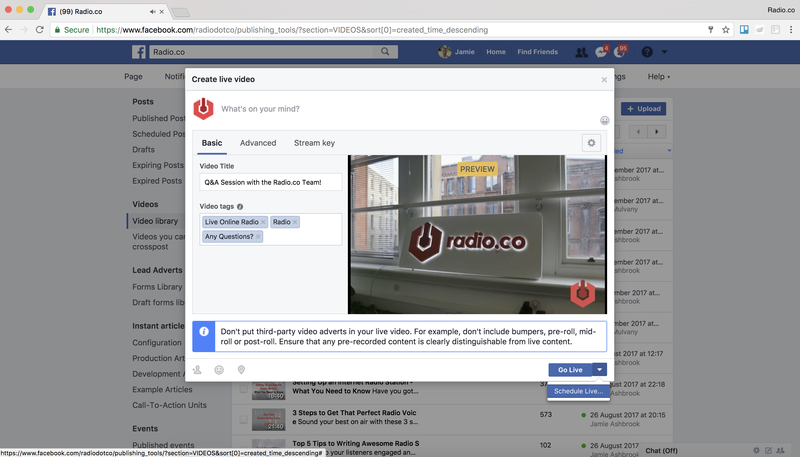 During your show, listeners will be able to comment in real time, send reactions, and share your video. You will also be able to see how many people are watching. When finished, your video will be available in your video library. Share it with listeners that may have missed out on your live show.